I was thrown the challenge to make low carb Chelsea buns – well what do you know, I did it. 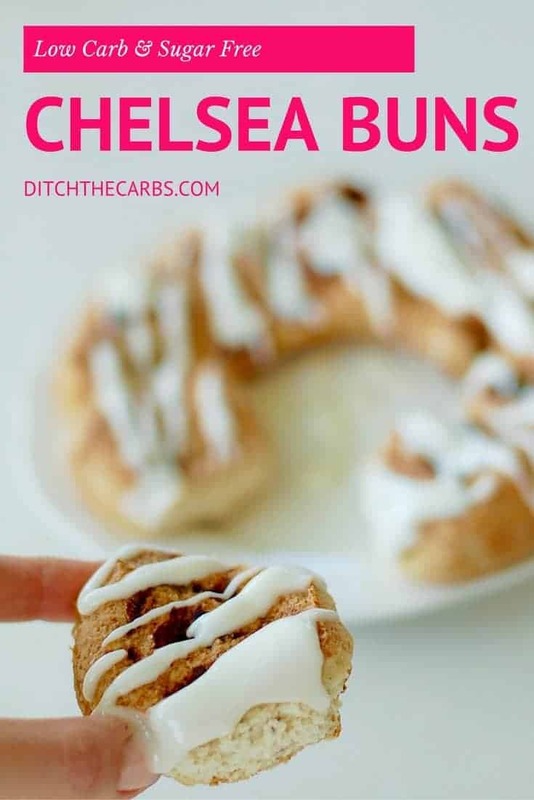 The best and easiest low carb chelsea buns you’ll ever find – seriously, these taste so good. At only 5.5g net carbs per serving, these low carb Chelsea buns are soon becoming a favourite in our house, and hopefully yours too. I can’t remember the last time I ate a Chelsea bun. Soft on the inside, full of sweet cinnamon and drizzled with a sweet glaze. My recipe for low carb Chelsea buns replicates all of this, only low carb, sugar free, grain free, gluten free and super simple. Chelsea buns look a lot like cinnamon rolls, so what is the difference? Chelsea buns are more common the UK and cinnamon rolls are more commonly found across the ditch in the US. Chelsea buns inside sometimes have lemon zest, raisins or mixed fruit. They are so incredibly alike, so call them what you wish. I had a play around with my focaccia recipe which is mainly psyllium husk and water, but knew that needed some extra flavour, bulk and fluffiness. I used coconut flour in the focaccia bread but Chelsea buns need a sweeter taste that is devoid of the coconut taste. I replaced whole eggs for egg whites so it was lighter and white in colour. 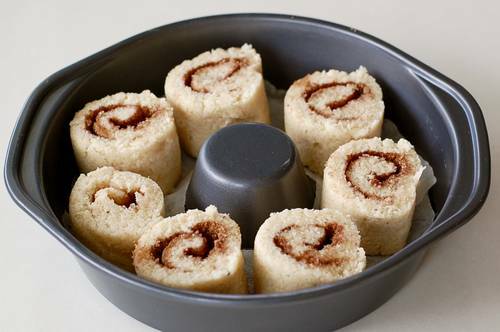 By adding some almond meal/flour, made the dough light and fluffy but sturdy enough to roll up with sweetened cinnamon inside. I tried the recipe a few times and came to the conclusion my original focaccia with coconut flour just wouldn’t work. TOP TIP :: I experimented with the amount of water the recipe required. It actually varied each time I made it depending on how humid the weather was. So if your dough is a little sticky, add an extra tablespoon or two of psyllium and if it’s too dry, add a teaspoon of water at a time. Low-carb Chelsea buns are so light and fluffy, who knew they could be this easy to make (and enjoy). Place all the dry ingredients together in a bowl and mix well. Make a hole in the middle of the dry ingredients and add the egg whites and vanilla. Mix just a little so you can't see the egg whites any more. Add 1/3 the boiling water gently and slowly, mix. Add another 1/3, mix. Add the final 1/3 and mix until it looks like a sticky dough. If the dough looks too wet, add an extra tablespoon of psyllium husk, if too dry, add a teaspoon of water at a time. Pour the dough onto a large sheet of baking parchment/paper. Place another piece of baking parchment/paper on top. Press out with your hands until it is a rectangle shape and 1cm / 1/2 inch thick. 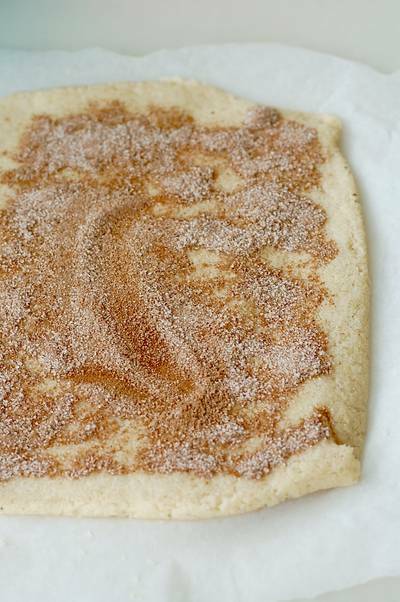 Mix the cinnamon and sweetener together and sprinkle all over the rolled dough. 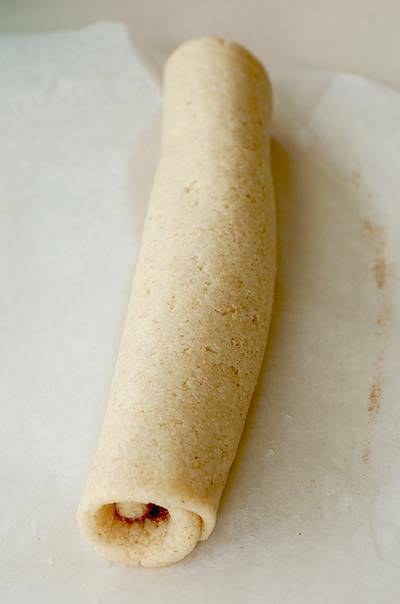 Using the baking parchment/paper, start to roll the dough up along the longest side. Continue to roll it into one long roll, then cut into even slices. 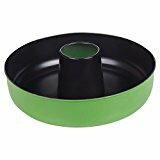 Place each slice in a ring tin that has been oiled and lined. Bake at 180C/350F for 20-30 minutes, or until golden, and baked in the centre of each Chelsea bun. Mix the powdered sweetener, vanilla and water together to make a liquid glaze. Drizzle, pour or spoon all over. 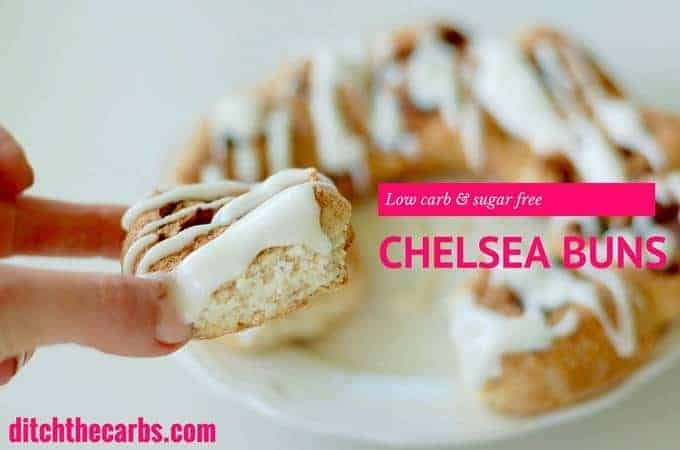 Follow these 4 easy steps to create the perfect low carb Chelsea buns. 1: Roll the low carb Chelsea bun dough into a rectangle. 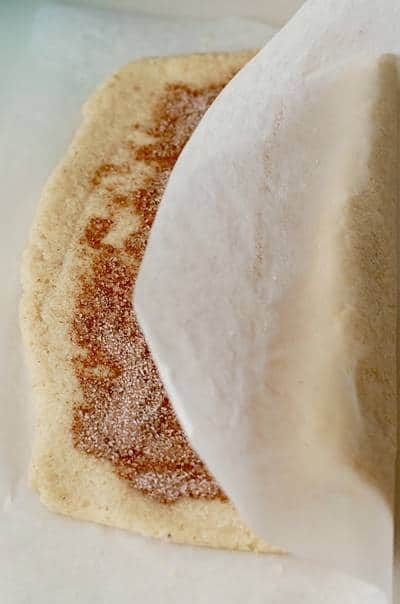 Sprinkle with cinnamon filling. 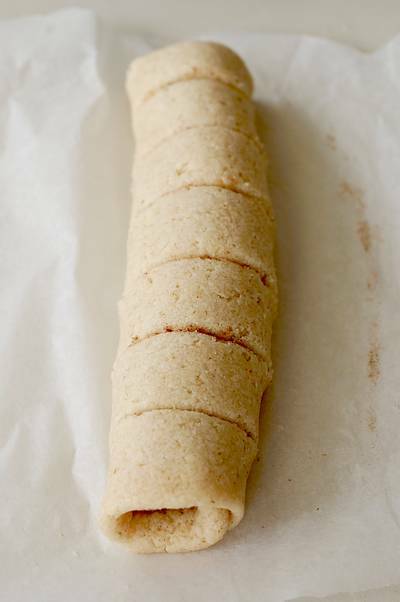 2: Using the baking parchment/paper, roll the dough tightly. 3: All rolled up, ready to cut. 4: Cut with a sharp knife into even slices. Place each Chelsea bun into the lined ring tin with enough space to rise when cooking. Oh dear, mine turned out quite heavy and dense and looked brown, not white like your picture. Tasted ok though. These are so delicious! Thankyou Libby for another fantastic recipe! Gave these try this weekend, reckon they came out pretty well, could have been lighter, but like you said the particular version of Almond flour makes a difference to texture. How can I post a pic so you can give me some suggestions please? It’s pretty difficult to add photos here. 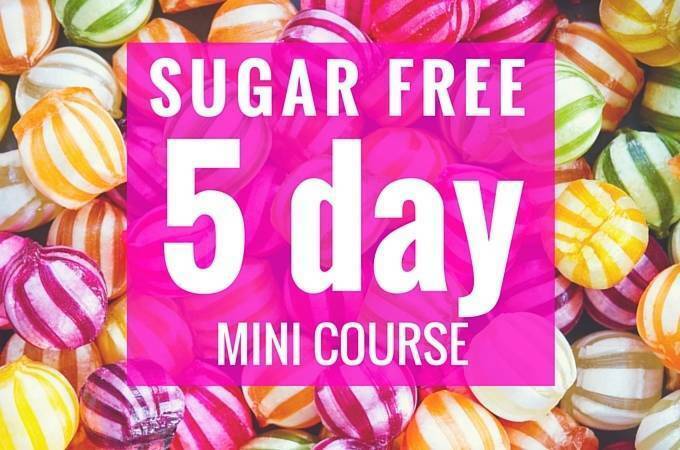 An easy way for me to take look, is to post them to Instagram and tag me @ditchthecarbs then I can see. I love seeing what everyone is making and sharing there. Your hard work at developing recipes is really appreciated. There is so much to learn about ingredients and how they work. I made these today and they were dark and chewy after 18 min. It seemed as if the middle was not cooked all the way through. So I popped them back in for another 10. What could I have done wrong? It sounds like the oven wasn’t hot enough or you didn’t make the centre hollow like I do with my ring tin. I love the ring tin as it allows the centre to cook so evenly. These look wonderful! My mom’s traditional recipe uses butter in the cinnamon mix. Would that work with these, or would it screw up the texture? I add the butter AFTER it is cooked. I cut the muffin in the centre, then pop slices of butter, sweetener and cinnamon in there – amazing. Can I replace the psyllium husk with flax seed meal? Unfortunately not. Psyllium husk has the amazing quality of absorbing water and swelling so creates a lovely light fluffy “dough”. 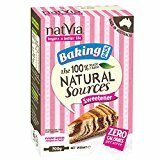 Here is my Ultimate Guide To Low-Carb Flours which may help. This is a little off topic but do you have any suggestions for leftover egg yolks? I’m starting to accumulate egg yolks because several recipes that I have tried call for whites only. I’ll be trying this recipe tomorrow and I love your site. I am new to LCHF and this site has been a godsend for recipes and information! I recommended your site to my doctor and she is giving it to other patients with high cholesterol and pre-diabetes. Wonderful! I will give those a try! Sorry, not for this recipe. 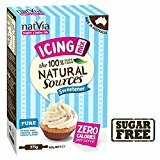 you could try the 1 minute muffins and add sweetener and cinnamon as I do. Yummy. Made these and they came out dark, dense, and chewy… Not at all what I was hoping for…. What could I have possibly done wrong? Hmm, did they sit too long before popping in the oven? The eggs, psyllium and hot water should have made them fluffy and light. Pop them straight in the hot oven as soon as they are rolled up and in the baking tin. I made these and during the baking process they turned black… what did I do wrong? Wow, I have never ever heard of this before. I have made this at least 6 times and never found this. Are all your ingredients in date? Did you accidentally add something else? I think we can blame some sort of gremlin at work here. Do you beat the egg whites to stiff first as my first batch came out very dense? Also very dark. Are there lighter/darker versions of psyllium husk? No I don’t whisk the eggs at all, just kind of ‘throw it altogether’ type of thing. The hot water makes the psyllium husks swell and go light and fluffy. Ensure it is cooked as soon as it is made to ensure any air bubbles caught up in the dough are cooked into the cinnamon bun. I refer to psyllium and psyllium husk powder as the same thing. As long as it’s not the whole husks or the seeds. We can only buy one type here but I see there are so many variants available in the US. If you are adding psyllium to foods, the powder may be a better choice because of its finer texture, but both forms of psyllium will work and provide the same health benefits. Hi, I can’t get psyllium husk, could I use some exanthan gum instead, I would love to try these, thanks. Is the carb count for the whole recipe? No it is total carbs per piece, to find net carbs, just deduct the fibre. 13.7g – 8.2g = net 5.5g. It is high in fibre due to the psyllium. Can these be baked then frozen? I’m not sure, I would think that would work as long as it is an airtight container. We have 5 in our house so this is devoured before I know it.